Three vertical columns bear the labels: "2010-2011. "; "Aug.-Oct. 2012. "; and "Nov. 7, 2012." The first column, labeled "2010-2011. ", shows a man pointing at a vertically-positioned chart that contains only the following text: 13 Keys. Some distance below the man is a small empty elliptical shape. The second column, labeled "Aug.-Oct. 2012. ", shows the same man pointing at the same chart. Some distance below the man is a medium-sized elliptical shape containing the following three fragments of text: "Obama a Likely Win. "; "Despite Keys, Obama is No Lock. "; and "Obama Loses First Debate, May Lose Election." The third column, labeled "Nov. 7, 2012. ", shows the same man pointing at the same chart. Man: My work here is done. Some distance below the man is a large elliptical shape containing the following numerous fragments of text: "Women's Vote Made the Difference. "; "Analysis: Why Romney Lost. 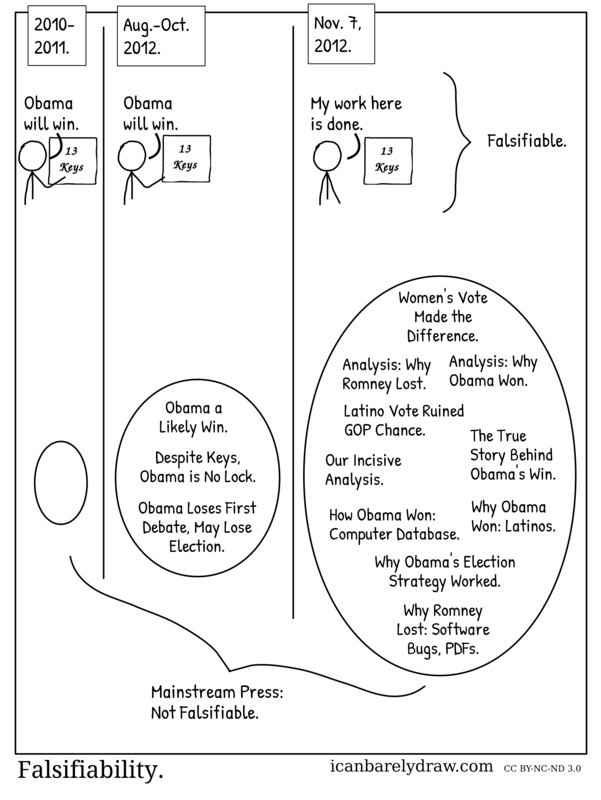 "; "Analysis: Why Obama Won. "; "Latino Vote Ruined GOP Chance. "; "Our Incisive Analysis. "; "The True Story Behind Obama's Win. "; "How Obama Won: Computer Database. "; "Why Obama Won: Latinos. "; "Why Obama's Election Strategy Worked. "; and "Why Romney Lost: Software Bugs, PDFs." Towards the right-hand-side of the third column, a large vertical brace character is aligned with the three instances of the man, and points to the right towards the following text: Falsifiable. Below the three elliptical shapes, and angled so as to include all three in its scope, is a large brace character whose pointed side slopes down and to the left, and points towards the following text: Mainstream Press: Not Falsifiable.